See below for more ideas for use…..
* These are great to use with any subject matter and an ideal start to learning to find and gather information. * Each page could be completed in groups with 2 or 3 facts per page. * Each child could be given just one page to complete one interesting fact – then all pages can be put together to create a class book. 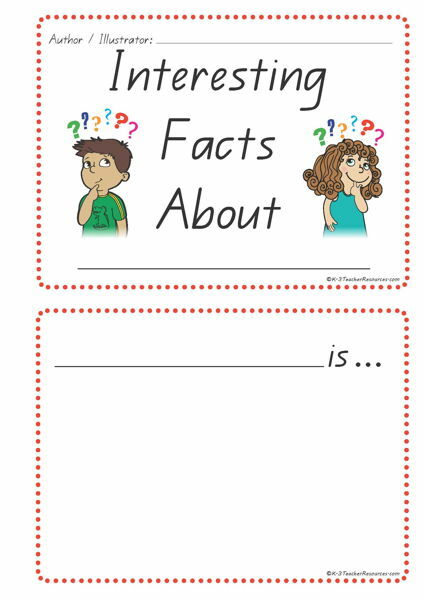 * Instead of making a book – enlarge the pages and make up an Interesting Facts display about a certain topic – have the pages available for children to grab and write on whenever they come across an interesting fact and add it to the display. * You could also use this idea for Interesting Facts about a character in a book also.